Tornado Warnings Can’t Keep Me From Blogathon 2013! Today marks the start of the 2013 WordCount Blogathon. It’s an annual challenge to writers and bloggers to post every day for 30 days. The event ends on June 30 with a twitter wrap-up party and raffle prizes for those who manage to post to their blog despite unexpected work obligations, family responsibilities, or acts of nature. This is my first year to participate, which I’m doing here on my newly created Travel Browsing blog. And I’ve been excited for the official start date, armed with a calendar full of pre-planned topics to write about. And then the night before the event changed my focus for this first official Blogathon post. Yep, one of those “acts of nature” made me forget everything for a while except the safety of my family. It started when I turned on the TV after going to bed last night to check in on whether I’d be sleeping to the sounds of thunder again (which has been an almost constant this week.) What I saw caused me to call and wake up my parents at 12:30. There was a tornado warning issued for their town of Sallisaw, Oklahoma (just 35 minutes from my town in Arkansas) and a giant “super cell” storm, with a prediction of winds of 50-60 miles, aimed right at them. See the big red blob? 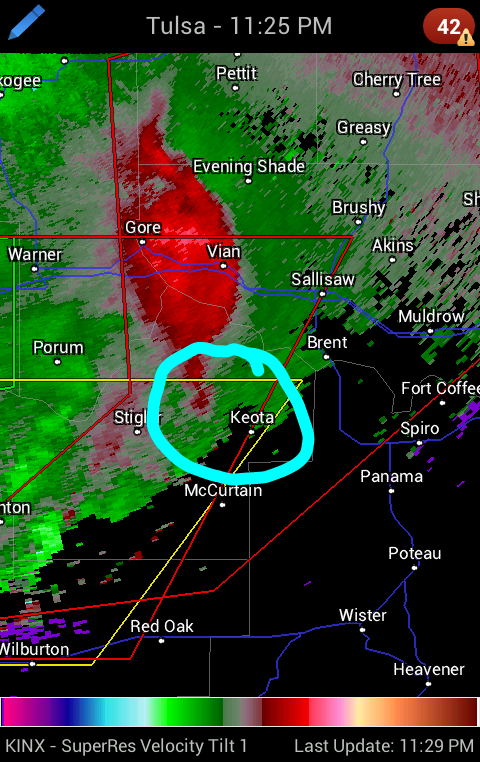 Imagine it 1 hour later to the right, next to Sallisaw. With images still in our minds of the horrible tornado damage done earlier in the day in Oklahoma City (and last week in Moore, OK), my Mom and I talked by smartphone as they grabbed supplies and headed into their safe area. Their internet wasn’t working and their satellite TV had been knocked out and they don’t have a weather radio (yep, I’ll be making sure they remedy that soon!). So I relayed information to them while watching my local news. A huge relief came when the weather man announced that “rotation has lessened” for the area. But that was short-lived as the new report showed that the storm was now heading towards me, along the I-40 corridor. 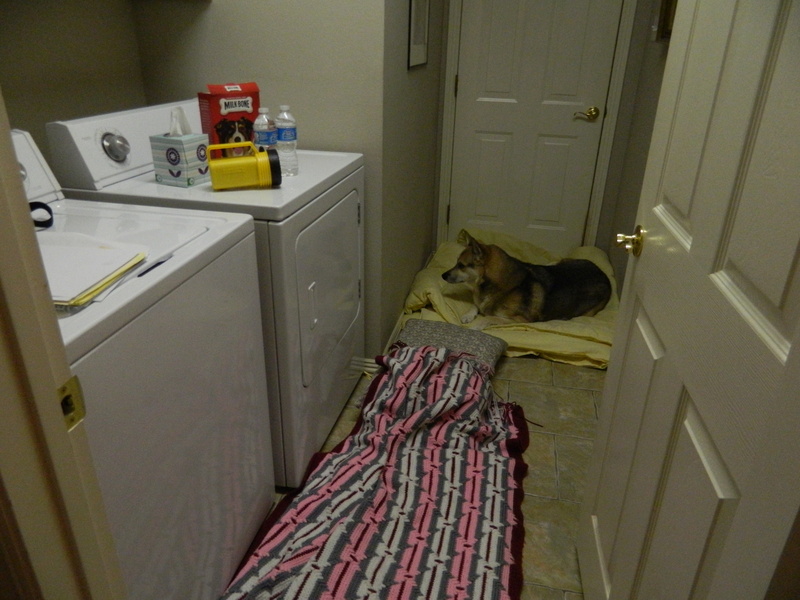 So I gathered up important papers, bottled water, blankets and pillows, and the dog and his bed and put everything into my hopefully safe area – the laundry room. Still, I wasn’t too worried at first. I was born in Kansas and have a lot of relatives all over the Midwest region. That means I’ve been through a lot of tornado watches, warnings, spottings, etc. And I’ve seen that these storms can turn on a dime, usually on a northeast pattern. I live directly east of my folks, so figured this one would go just north of me. Nope. It’s a bit surreal to see a local weather forecaster show a map on TV with a giant red circle, signaling a super storm, directly over the words of your town. “If you’re in Van Buren, you need to take cover RIGHT NOW,” said Channel 5′s Garrett Lewis in a calm but stern voice. And then the city sirens went off. Long story short — we chose to sleep on the floor of the laundry room with the News still live streaming on the laptop while storms raged on. I woke up periodically from the storm noise and hard tile floor. But it was a relief each time to hear the continuing reports from Lewis, who broadcast all night. Our designated safe area – actually the laundry room! Although several storms are still going on all over the region this morning, they’re the more typically summer-time show-offs – small but irritatingly noisy. And with all of the heavy rain (Sallisaw had 4″ overnight) there are flood warnings for several roads. Still, I ran out for a quick walk around the house and everything looks fine, as does a fast look over the neighborhood. And I heard from my parents that they are fine, as are other relatives in the area. So I’m counting my blessings. And crossing my fingers that the forecast for sunnier skies this afternoon comes true! Thanks for the welcome! I’m stubbornly pretending that Mother Nature is ready to calm down now and give us a peaceful summer. So excited to be blogging with you for the blogathon! Also very happy to hear your family is safe. I grew up in Michigan and live in Minnesota now, so storms are just a way of life for us Midwesterners huh? Thanks Amber! The sun actually did come out as promised. So I’ve spent too much time this afternoon catching up on sleep on the back patio. Welcome to the Blogathon, Deborah. Years ago we lived in the Fayetteville/Springdale/Morrow, AR area. One not-so-fond memory was waking up about 4am one morning to sirens and taking refuge in our bathtub. (Nothing notable happened to us but there was tennis sized hail nearby.) We haven’t been back to Arkansas in nearly 30 years and are thinking of taking a trip out there this fall. Interesting! I used to lived in Fayetteville but moved further south to be nearer family. I hope you all can make it out this way, and fall is gorgeous. Except for a few weather hiccups here and there, this is a great location with so many fun activities. In fact… my second post on this blog is a short overview of things in the area that I’ll be covering this month. Then in the Fall, I’ll definitely be heading back to Mount Magazine — my favorite place ever for leaf peeping! Hopefully the storms are done now for awhile. It is always so scary when they hit at night too because you can’t see what’s happening. I have always been afraid of tornados and I’m the first in my family to run to the safe room. Welcome to blogathon! I’m in my third year participating.I live outside of St. Louis so I, too, spent last night hunkered down as that storm made its way east. We head for cover whenever there’s a warning, and we have a basement which is where we hold down the fort. We were quite lucky last night, but there were several areas across the metropolitan area that they believe had tornado touch downs because there was lots of damage along a path through St. Louis heading east to over here in Illinois. I think the worst part was all the lightning and thunder which just sends our poor little Shih-Tzu into a tizzy. Well, I’m glad your family was safe! That was one powerful storm! So glad you all were safe from the storm too! And hope your sweet Shih-Tzu is all calm now. My dog basically slept through the whole thing! Thanks Anne and welcome to you too! It definitely wasn’t fun. But today is all sunny and beautiful. So it’s time for me to get back out and explore!